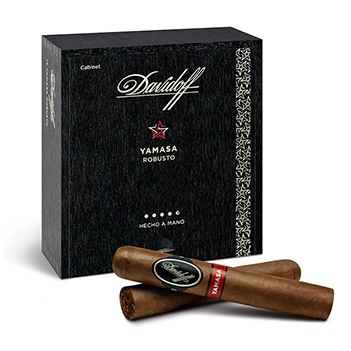 Davidoff's cigar visionary Henke Kelner took his team of experts to the Yamasá region where against all odds they began a 20-year journey to develop and grow the tobaccos that would be perfected and used for the beautifully colored, oily wrapper and binder of Davidoff's Yamasá cigars. A core of select spicy and sweet Nicaraguan and aged Dominican long fillers combine with the more intense Yamasá leaf to deliver an entirely new and intense earthy/spicy/sweet experience. Light up these deeply complex cigars and enjoy an immediate spicy Nicaraguan taste followed by flavors of nut, spice, coffee, cedar, earth, and black pepper. Smoke a Yamasá and you'll want to thank Henke for relying on his instincts and never giving up on the dream.